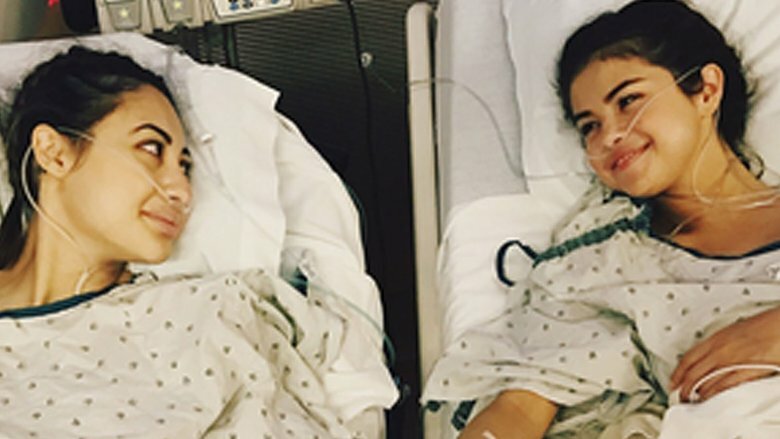 On Sept. 14, 2017, Selena Gomez revealed that she'd undergone a kidney transplant. "I'm very aware some of my fans had noticed I was [lying] low for part of the summer and questioning why I wasn't promoting my new music, which I was extremely proud of," Gomez, 25, posted on Instagram. "So I found out I needed to get a kidney transplant due to my lupus and was recovering. It was what I needed to do for my overall health. I honestly look forward to sharing with you, soon my journey through these past several months as I have always wanted to do with you. Until then I want to publicly thank my family and incredible team of doctors for everything they have done for me prior to and post-surgery. And finally, there aren't words to describe how I can possibly thank my beautiful friend Francia Raisa. She gave me the ultimate gift and sacrifice by donating her kidney to me. I am incredibly blessed. I love you so much sis. Lupus continues to be very misunderstood but progress is being made." We've got all the details about what led to Gomez's surgery, as well as what to expect from the "Bad Liar" singer's recovery and future prognosis. TMZ reported that Gomez was in "dire straits" before getting her kidney transplant in June 2017. The site claimed Gomez was hospitalized for kidney failure in May 2017 while she was visiting boyfriend The Weeknd in Chicago, where he was performing. At the time, Gomez was already on a waiting list for a kidney transplant. Sources noted that The Weeknd (real name Abel Tesfaye) was by her side the entire time. Sources also told Radar Online that Gomez was previously hospitalized for issues related to lupus, including exhaustion and malnutrition, going back as far as 2011. Gomez's uncle, Artemiz Arzola, told Radar Online in January 2017 that Gomez needs to rest up or else her hectic schedule will likely make her condition worse. "Selena's young. I know the temptations are there in Hollywood to go out and have a good time, but she needs to stop that and look after herself," Arzola, whose wife also suffers from lupus, said. "Her illness wears her body out, even with the drugs she takes. She needs to take her health seriously—now more than ever!" Gomez's aunt, Sofia, added, "She wanted to keep her [diagnosis] a secret, but she was very sick six months ago." In October 2015, Gomez revealed her lupus diagnosis to Billboard and said the disease was what prompted her to go to rehab in 2014. "I was diagnosed with lupus, and I've been through chemotherapy. That's what my break was really about. I could've had a stroke… I locked myself away until I was confident and comfortable again." In September 2016, Gomez canceled her tour and took time off to deal with emotional issues caused by lupus. "As many of you know, around a year ago I revealed that I have lupus, an illness that can affect people in different ways," Gomez told People. "I've discovered that anxiety, panic attacks and depression can be side effects of lupus, which can present their own challenges. I want to be proactive and focus on maintaining my health and happiness and have decided that the best way forward is to take some time off." Sources told People that Gomez's then-boyfriend, The Weeknd, scheduled his "Starboy: Legend of the Fall" tour dates around Gomez's operation. "It was a super-serious operation, and all her friends were worried," an insider added. Though the sources didn't specify when the operation took place, The Blast speculated that it happened in June 2017 because Gomez reportedly wasn't seen publicly between June 15, 2017 and July 11, 2017—and The Weeknd's tour didn't begin until July 22, 2017. The Blast reported that Gomez's family members would have donated a kidney to her, but they weren't matches. Someone who was: her best friend Francia Raisa, star of The Secret Life of the American Teenager (2008-13). TMZ reported that the operation was actually harder on Raisa than it was on Gomez. Raisa, a dancer as well as an actress and a "health nut," had to refrain from physical activity for two months after the procedure and has only just begun getting back into yoga. She is also on a restricted diet that must be monitored. Thankfully, she's reportedly recovering well and should be back to normal soon. A source told People, "They are more than friends, they consider each other sisters. They've seen each other through a lot over the years… If anyone was going to be a match for Selena, it was going to be Francia. Francia was more than happy to donate her kidney but hates that anyone ever found out. She wanted it to just be something she did quietly for her friend." Sources told Radar Online that the singer's first known rehab stint in 2014 was due to her "partying very hard" and "experimenting with marijuana and prescription drugs, including Xanax and Ambien." Sources also told TMZ that Gomez sought treatment for alcohol abuse. What's more, the National Enquirer reported that Gomez and Raisa both smoked marijuana and got tipsy during a Halloween excursion with Gomez's ex, Justin Bieber, in 2014. "Selena's next spiral is going to be less concealed, and even harder to recover from," a source told the National Enquirer. "She'll get into harder drugs… Selena's trying to focus on getting better, but the temptation to hit the clubs is too much to turn down." However, Gomez' most recent alleged rehab stay seems to have kept Gomez on the straight and narrow. "Since Selena got out of rehab, she has been cutting out all of the bad influences in her life," a source told Radar Online in December 2016. "Selena is sober now, and she is doing everything right. She is continuing to see a therapist and surround herself with positive influences." Insiders told TMZ that Selena Gomez's religious beliefs helped her through her kidney transplant. A devout Christian and member of the Hillsong Church, Gomez reportedly believed her fate was in God's hands, which gave her the courage to face her fear and go through the operation. Sources revealed to TMZ that Bieber didn't reach out to his ex to wish her well in her recovery because he didn't even know she needed a transplant. Despite Bieber also being a member of the Hillsong Church, insiders claimed church leaders proactively work to keep the former teen dream couple apart. A source told the site, "They don't talk, period… It was a childhood thing. They've both had other relationships. It's over." The two have since been spotted together, sparking rumors that they may be rekindling their romance. Dr. Michael Lockshin of the Lupus and Antiphospholipid Center of Excellence at the Hospital for Special Surgery in Los Angeles, who hasn't treated Gomez, explained that she may need another kidney transplant someday, but likely not for another decade—if that. "If the kidney is a perfect match, it can go lifelong. Generally we start worrying at about the 10-year period," he told Hollywood Life. "There's chronic rejection that usually shows up around the 10-year mark. We've gotten people who've had levels of chronic rejection that went on 17-20 years with a their kidney transplant before being back in renal failure. But you won't see any of that until a 10-year mark." He said lupus is "a disease of young people. [For] most women, about 90 percent, the average age of onset of lupus is about 18-25. Sometimes, the disease starts very abruptly and a transplant is needed by that age." Ken Farber, CEO of the Lupus Research Alliance, told The Blast that since Gomez revealed that she underwent a kidney transplant because of lupus complications, the phone has been "ringing off the hook" with donations, and the website has attracted a slew of extra traffic. The site also noted that Gomez raised a great deal of money for the organization, donating portions of her tour ticket sales in 2016 to the organization. The Lupus Research Alliance isn't the only organization benefiting from Gomez's efforts. The United Network for Organ Sharing has also seen skyrocketing interest since her reveal. "We are thrilled every time someone gets a lifesaving organ transplant," Brian Shepard, CEO of UNOS, told The Blast. "There are more than 116,000 men, women and children, like Selena Gomez, still waiting for a transplant in the United States. Just one organ donor can save up to eight lives." Leading up to her transplant, Selena Gomez revealed to NBC News, "I had arthritis, my kidneys were shutting down — my mentality was just to keep going. I didn't realize how much it was affecting my body." Raisa noticed that Gomez was physically weak before the procedure, telling the outlet, "One day she came home and she was emotional. I hadn't asked anything. I knew she hadn't been feeling well. She couldn't open a water bottle one day. She chucked it and she started crying." Gomez revealed that the surgery took longer than it should have because of a complication. "My teeth were like grinding, I was freaking out," Gomez said. "It was a six-hour surgery that they had to do on me, and the normal kidney process is actually two hours. Apparently one of the arteries had flipped. I'm very grateful that there are people who know what to do in that situation." Gomez arranged for her and Raisa to stay together while they recovered, which required bedrest. "It was hard, because you constantly had to ask for help," Raisa said. "I think one of the most humbling experiences was helping put on underwear. We couldn't take showers by ourselves. It was a really brutal process." The procedure paid off. "As soon as I got the kidney transplant, my arthritis went away," Gomez said. "My lupus—there's about a 3 to 5 percent chance it'll ever come back. My blood pressure is better. My energy, my life has been better."